I feel dumb even posting this as a recipe because it’s not really, BUT I for some reason had never thought of it before I saw it somewhere, so maybe just the fact that I put it up here, someone will say hey, ya, I’m gonna do that. These are great of summer days, but are not packed with all that sugar like the store bought Popsicles. Plus, in my opinion, they taste a lot better. 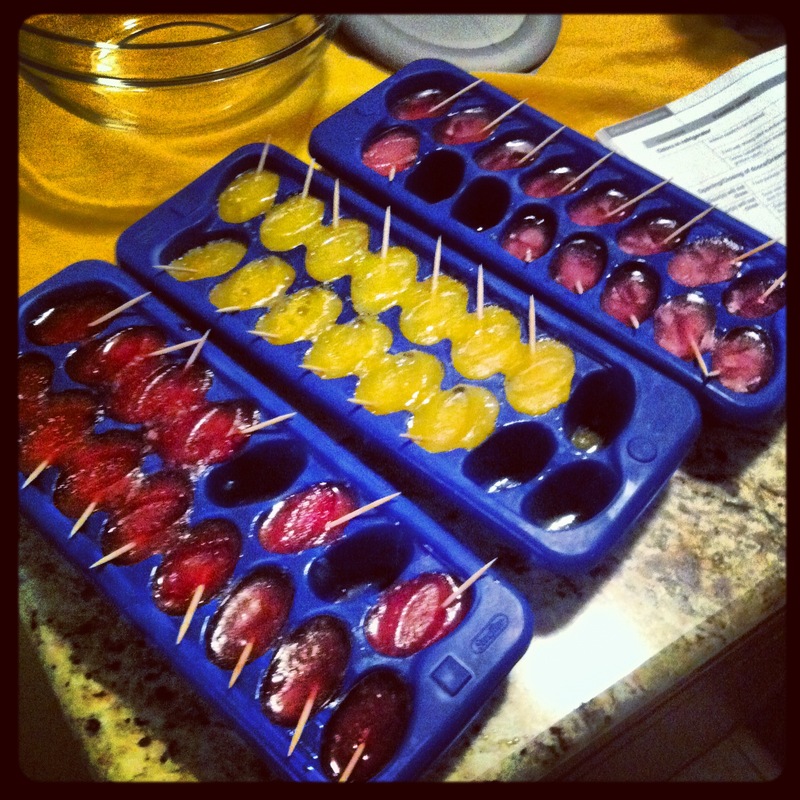 Fill ice cube trays with various fruit juices. Place stick in each cube space. Now, you see in the picture that they were already some missing. That is because I cannot pull these out and my daughter not want one. Now I am not a big juice person. I rarely ever let my kid have any juice and like to limit her sugar as much as I can (more so because her head starts to spin around when she gets it, than it being bad for her.) Each cube is not that much juice at all and she enjoys it for a long time. I used toothpicks for my sticks because that is all I had available at the time. We have not had any emergency room trips thus far, but I would suggest doing something else. If they make a shorter Popsicle stick, that would be perfect. I tried orange, cranberry, and grape juices this time. The orange and grape were great, but I didn’t care for the cranberry. It was too tart, but the kids still ate them. Actually, while I am writing this my daughter came up and asked for one. Haha. I also never thought of this till I saw a friend do it a few years ago. Just a tip: If you want the sticks to stay vertical wrap you tray with plastic wrap and then stick the sticks thru the plastic and it will hold them in place as they freeze. I absolutely love your ideas and recipes. Please post more. Thank you. Thanks so much for the tip and compliment! Nice to know someone enjoys it. 🙂 I’ve kind if taken a break from blogging since I had my baby but will hopefully write some more soon!